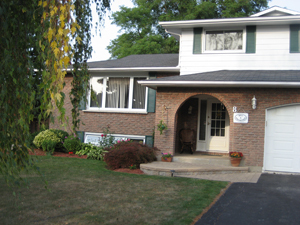 Located in the Old Town, A Pillow and Toast B&B is the perfect destination for those who decide to enjoy leisure time close to the Shaw Festival theatres, renowned wineries and the breathtaking Lake Ontario. We offer a choice of three comfortable and spacious bedrooms with Twin, King or Queen beds with ensuite and private bath. Enjoy a delicious full/continental breakfast, a large living room with TV/DVD and wireless access to Internet, and the beautiful, peaceful backyard. The house is air conditioned, smoke and pet free. Open all year round. You don't need to stop for lunch after our breakfast! We are accommodating any dietary needs. Large selection of healthy fresh products. Local fruits and vegetables over the season. @ your leisure from 5:00 to 11:00 A.M. Available on the patio free of charge.